The Sound of Vaudeville, Vol. 2 covers the career of Eddie Morton from 1911 through 1917. He was one of the variety stage's most important song pluggers of the era: if Eddie featured it, it would be a hit. All-time classics include "The Oceana Roll" and "Play That Barbershop Chord." Don't miss Morton's own compositions, "Noodle Soup Rag" and "I've Got You, Steve!" Researcher Ryan Barna revisits the early life of Morton and fills in some gaps before taking us to the end of Eddie's stage life and beyond, when he ran a restaurant on the Wildwood boardwalk called Ed. 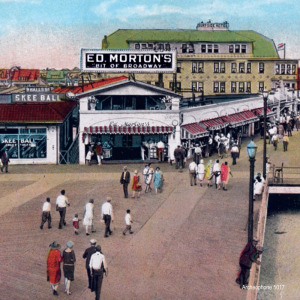 Morton's "Bit of Broadway." Visit Bit of Broadway's expanded catalogue page to see the complete track listing, read an extended description, and listen to sound samples.